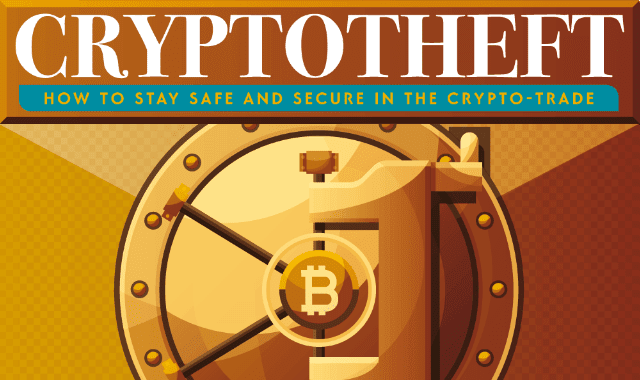 Crypto Theft: How To Stay Safe And Secure In The Crypto-Trade #Infographic ~ Visualistan '+g+"
In crypto security, and cyber security in general, we tend to fear the faceless hackers in the dark basements of America, running complex algorithms night and day in order to crack our Facebook passwords. But in reality, these kinds of hacks are rare and outdated. With the countless firewalls and security measures in place, criminals know that the weakest link is the users themselves. A scam nearly as old as the internet itself, phishing is surprisingly the main culprit of stolen crypto. Over $115 million worth of crypt has been stolen using this simple method; provide a seemingly professional link and prompt your victim to enter their own data in the login boxes. Simple as that. For newbies and veterans alike, remaining vigilant in the face of massive crypto breaches is difficult, yet essential. Take a look a this infographic for more on the crypto security crisis and how a little common sense can go a long way.